Enola Gay is a strategic bomber Boeing B-29 Superfortress of the USA army, that dropped an atomic bomb “Little Boy” on August 6, 1945. Paul Tibbets, an aircraft commander, named the craft after his beloved mother and her name went down in history. Crew of the aircraft, commander Paul Tibbets with a pipe is in the middle. The photo was taken on the Mariana Islands in 1945. There people are responsibe for death of over 200000 people, the number that is quite difficult to understand or imagine. On the contrary to the existing myth, no one of the Enola Gay crew had psychological problems, related to their mission neither before, nor during or after the fulfillment of the task. The crew of “Boxcar” (a less known aircraft, which dropped a plutonium bomb “Fat Man” on Nagasaki) also had no problems. Later they will all say that they were “Simply following their orders”. Boeings B-29 Superfortress aircrafts were usually painted blue to make them unvisible in the sky. Though, it was decided not to paint Enola Gay in order to reduce the effect of the thermal radiation of the nuclear explosion. However, a lot of Boeings weren’t painted because of economy and the lack of paint at that time. Since 1995, the Boeing has being located in the National Air and Space Museum (Smithsonian Institution, USA). This exhibition has caused a lot of controversy as for the ethical implications of this exhibit. “Little boy” nuclear bomb shortly before the loading into the bomber. Less than 2% out of 140 lb of enriched uranium reacted in the bomb and the rest of it fell out in the form of nuclear fall-outs. It made the “Little Boy” one of the “dirtiest” nuclear bombs ever used in the history. For comparison: more than 80% of radioactive materials take part in the explosion of the modern nuclear and thermonuclear ammunition and it gives an opportunity to reduce the weight of the bomb and as a result to reduce the nuclear pollution of the area. Inefficent in terms of pure physics the destructive power of the blast was quite enought. City landscape before and after the bombing (aerial view) Hiroshima castle can be seen in the top right corner. This castle was completely destroyed by the explosion, though it has been restored nowadays. Some buildings seem to be intact, but it’s not true. Due to the angle of the explosion and physical nature of blast wave only the walls of some buildings left intact. The agony of a Japanese girl (1200 meters from the epicenter). Skeletonized remains in the ruins of a house. Because of a great number of bodies, they couldn’t be buried and were just brought to the outskirts of the city. This was the very shot, which inspired James Cameron to show a field of skulls in a film “The Terminator”. Asphalt became dark under the effect of the luminous radiation flash. The fencing bollards defended some parts of the asphalt, which were left light, giving the permanent nuclear shades. This wall, on the contrary, was painted dark, but then it faded under the influence of the flash. The covered part of the wall made a permanent nuclear shade in the form of a valve. Infrared burns from the dark elements of the kimono pattern. People suffer from radiation disease, ten days after the explosion. Most sick people had an enteric form of the radiation disease. Japanese doctors were not acquainted with this disease and at first they thought that there was a dysentery outbreak in the destroyed city. Patients couldn’t get any specific treatment. The Gembaku Dome (jap. 原爆ドーム the Atomic Bomb Dome or a Bomb Dome) was an Exhibition Center for the Hiroshima Chamber of Commerce and Industry before the World War II. It was situated in 160 meters from the epicenter, though its walls and some parts of the building remained intact. All the people who were in the building at the moment of the explosion died. After the war the Dome was strengthened in order to be saved from the further destruction and it has become the most famous exhibit, which is connected with the nuclear explosion. In 1996 the Gembaku Dome was designated as UNESCO World Heritage Site. Nowadays it is the only building, which was saved in its original appearance after the nuclear explosion. Hiroshima Chamber of Commerce and Industry a few months before the nuclear attack. It seems incredible that the metal skeleton of the dome survived the atomic blast at such distance. The territory of the Gembaku Dome didn’t go through the full decontamination, so even now, it is not recommended to stay among these ruins for a long time. For this reason, as well as in order to avoid vandalism, the building is fenced and moreover, it is under round the clock surveillance. The grass and tree sprouts inside the building is regularly weeded; otherwise it would have long been overgrown during 60 years. The walls are regularly strengthened and repaired. The building has been preserved in such condition since 1945. Nuclear shades from the balks are visible even nowadays. The main museum complex was lifted up a few meters above the ground on stilts, according to the architect it should symbolize the ability of mankind and of the Japanese people to rise from the ashes of war. Memorial to the victims of the bombing, flowers lay at the memorial all the year round and they are changed before they wither. The Gembaku Dome, Memorial Center as well as the Hiroshima Peace and Culture Center form an architectural ensemble. The shock wave of a nuclear explosion dispersed the glass shards to supersonic speeds, and they easily broke concrete and human bodies. The splinters continued getting out of the victims’ skin during many years after the tragedy. Drugstore beakers melted together (500 meters from the epicenter). A hat and a belt belonged to Eiti Tsuda (13 years old); a shirt and pants belonged to Hajime Fukuoka (14 years old); leggings belonged to Masayuki Ueda (12 years old). Only Ueda survived after the explosion, but he died from burns and internal injuries the next morning. Clothes, taken from the corpses of two girls (found 500 meters away from the epicenter). Nobuko Osita sewed this uniform herself. She studied at the first form of high school for girls, and on the day of the explosion she was in just 800 meters away from the epicenter. After receiving critical burns the girl got to her parents’ house, but she died a few hours later. She was only 13 years old. The surface of the tiles on the roof partially melted, making it rough to touch. The left side was covered with the adjacent tiles and it remained unaltered. Hieroglyphs were written with ink, which absorbed more infrared radiation from the explosion and have burned paper. Until now, you can read a piece of text «on July 28». Teruko Aotani (13 years old) studied in the first grade of the «Aki» high school for girls. She was a member of a working program of assistance to the state. At the time of the explosion she was at her working place, she was at a distance of about a kilometer from the epicenter, as a result she had burns over 90% of the 4th grade with charring, but some incredible efforts helped her to pass more than 5 kilometers to her native home, where she died the next morning. Her mother cut off a lock of miraculously survived hair in memory of her daughter. Miyako (13 years old) was in 550 meters away from the epicenter. The only personal thing of Miyako, found in the analysis of the ruins, was her sandal (geta) which was identified by her mother. The identification was done by a pattern on the cloth fastenings, made on the old kimono. Her body was flattened by the blast wave and an imprint of a child’s foot was noticeable on a sandal, which arose at the moment of her death. No one of 543 Miyako classmates who were in the same building survived. Most of them stayed alive for 12 – 36 hours, going through terrible torment. No one of them received full health care or anesthesia. Noriaki was a pupil of the first class at a high school and he was just 500 meters from the blast site. It is incredible that Noriaki had survived after the explosion, but his body received horrific burns, his skin and muscles began to fall off and hang like ribbons. With the help of a friend, who suffered a little less injury, Noriaki got home. Because of the fluid loss out of extensive burn surfaces, before his death Noriaki suffered from unbearable thirst and began to lick the lymph leaking from his burns . Noriaki Teshima died in terrible agony the next day. His mother saved the skin and nails from his hands, which got off like a glove. She wanted to show these remains of her son to her husband, but he did not return from the war. Shigeru Orimen (13 years old) was a first year student of Hiroshima high school number 2. At the time of the explosion he was 600 meters away from the epicenter. His mother found his burnt remains on August 9. She was able to identify her son only by obento (lunch in a box) that she had prepared him in the morning on the day of the explosion. Before his death, Shigeru pressed the box to the stomach and there were only ashes left from the lunch inside. A shock wave knocked him out of his shoes as it happens when a pedestrian is hit at a high speed by a car. The boy died instantly (900 meters from the epicenter). Afterwards his mother found his body near the school pool and cremated his remains. A few days later, a shoe that belonged to Sasaki was found among the wreckage. There was a hole in the sole of the shoe; the boy covered it with a piece of cardboard. On the day of the bombing, Yoshio was in the main building of the Ako Corporation. A strong concrete building protected Yoshio from a shock wave and thermal radiation. Only his hand was injured, as it was stuck in the window at that moment. Due to the ionizing radiation of the explosion, Yoshio’s nail plates were damaged and as a result nails grew irregularly shaped and black. Due to immence heat of the explosion human body evaporated in instant, while man (or woman it is unknown) was sitting on the steps. Before being brought to the museum, these stones were in the open air for about 10 years and the body print faded. The same place, the photo was shot several months after the explosion. 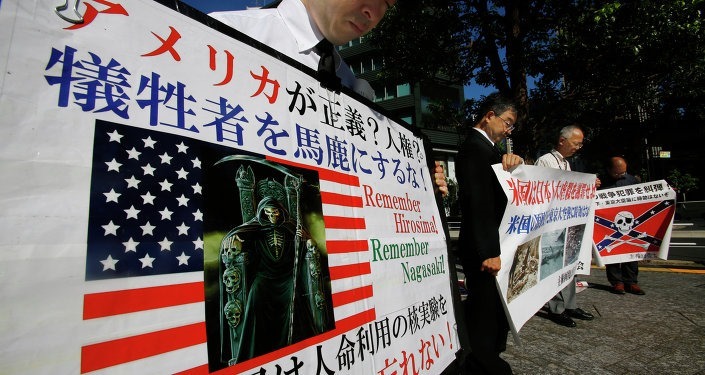 Japanese citezens demands an appology from US government. Nowadays, the US and even some Japanese historians think that nuclear strikes have been a good for Japan. They have led to immediate capitulation of the Japanese empire. And according to some calculations, they saved more lives which would have inevitably lost during the operation “Downfall” (Japan Ground assault by the US Army). Moreover, the capitulation helped Japan to preserve the island of Hokkaido, which could inevitably annexed by the Soviet Union. I cannot judge the people of that time, but still, I do not think that any of the geopolitical and military purposes will ever be able to justify the agony of children with burns of the 4 degrees. However, the US government has always been indifferent to civilian deaths, if only they were not Americans. In Japan, the Obon Festival of the dead is held on August 13-15. On the last day of the festival, families and descendants of those who died in Hiroshima during the nuclear bombing place paper lanterns on the Ota River to float. On this day, Ota becomes the river of fire. Life is too tenacious and our Earth is too large, so even a simultaneous explosion of all existing nuclear weapons cannot completely destroy the biosphere. In vanishingly short, from a geological point of view terms, the already existing as well as new forms of life will take place of the vacant ecological niches. The nuclear apocalypse will not lead to the end of all life on the Earth, but to the destruction of mankind. I want to believe that the Fermi paradox has more encouraging solutions, for example, that we are really the first most technologically advanced form of intelligent life in the universe and in this case, we have a big responsibility, at least not to destroy ourselves.